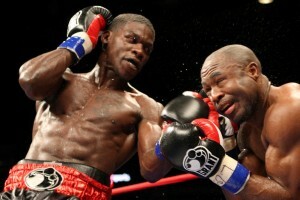 NEW YORK (March 31, 2011) – After three straight victorious appearances on ShoBox: The New Generation, Marcus Johnson hopes to make his fourth an eye-catching performance on the path from prospect to contender. Touted as a top American prospect on many boxing lists, Houston’s unbeaten and hard-hitting Johnson (20-0, 15 KOs) will make his fourth consecutive appearance on the popular series featuring boxing’s youngest and brightest stars as he goes up against another ShoBox alumnus in Boca Raton’s Dyah Davis (18-2-1, 9 KOs) on Friday, April 8, in a 10-round super middleweight main event as part of a spectacular tripleheader LIVE on SHOWTIME (11 p.m. ET/PT, delayed on the West coast). The night of boxing begins with two exceptionally matched co-features. Two unbeaten, 14-0 fighters will square off in an eight-round junior welterweight affair as 25-year-old and brand new father Danny O’Connor (14-0, 3 KOs) takes on 30-year-old Gabriel Bracero (14-0, 1 KO) of Brooklyn, N.Y., by way of Puerto Rico. In the evening’s first televised fight, a pair of 23-year-olds tangle as former amateur standout Willie Nelson (16-0-1, 10 KOs) of Cleveland, meets Vincent Arroyo (10-1, 7 KOs) from Amherst, N.Y., in an eight-round welterweight bout. Promoted by DiBella Entertainment, the “Rumble on the Rio” will originate from the Laredo Energy Arena in Laredo, Texas.